Amnesia Collection is a collection of all three popular PC horror games that was released two years ago for PS4 and is now available for Xbox One. The collection includes three games: Amnesia The Dark Descent, Amnesia Justine and Amnesia A Machine For Pigs. The first two games are developed and published by Frictional Games and A Machine For Pigs is developed by The Chinese Box and published by Frictional Games. All three games are first person horror games and they all share some of the best sound I have ever heard in a horror game. Frictional Games has the potential for making a mouse sound as frightening as a lion in these Amnesia games. All three games have some extremely unpleasant sounds at times that makes the atmosphere all the more terrifying. It's amazing how a creature that is human-sized while viewing it can be made to sound like a grotesque room-filling abomination from which there is no escape when the camera is not facing it. Your character is never prepared to battle enemies, so you must run and hide from them. One of the best parts about all Amnesia games is that they are creepy from overall atmosphere and environmental noises rather than constant jump scares. 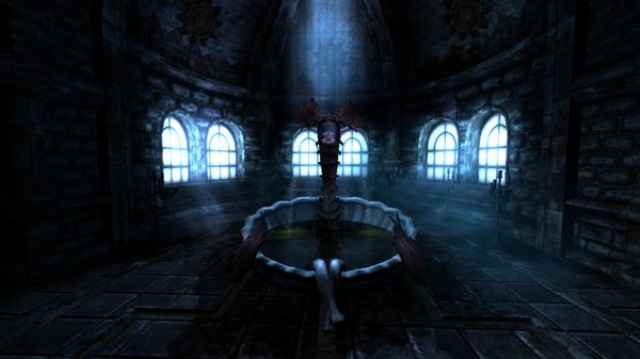 Amnesia: The Dark Descent is easily the best game in the collection and has gained a reputation for being one of the scariest horror games ever made since its release on PC. You start out as a guy (Daniel) that has lost his memory. Daniel finds a note written by himself that mentions a shadow that is hunting him and that he must go down to the inner portion of the castle and kill the baron. While moving around the castle and unlocking different rooms and solving puzzles, you'll have to watch out for creatures that await in the dark and stay away from the dark itself. Staying in the dark for too long will cause Daniel to lose sanity which will cause visual and audio hallucinations. Players must find tinderboxes to light candles and torches and stay in the light as much as possible to regain sanity. You'll also have a lantern to equip in order to light up dark areas and keep your sanity high, however the lantern constantly consumes oil, of which you'll only find a limited amount of. To interact with objects such as doors or cabinets, you must wait for a hand icon to appear then press and hold the interact button and move the object by pressing forward or backward on the thumbstick in order to manipulate it. If you've played SOMA, you'll be familiar with this way of manipulating objects. The overall stealth system is set up like SOMA as well. While hiding from monsters, you can peak around corners using a swaying move. Monsters can't see you if you get behind an object or hide in the dark. The Dark Descent has some very unique puzzles that require a good bit of thought at times. Some of the puzzles require physically throwing objects and some of them require manipulation of certain objects and some of them can be quite cryptic. The Dark Descent features multiple (three) endings. Amnesia Justine is an add-on for The Dark Descent. Justine is a separate story mode that is set up like a survival mode - if you die, you must start all the way over. Justine is quite short when compared to The Dark Descent, but it has an overall good story to it and is enjoyable. In Justine you play as a woman that must work her way through sections of the castle while given the moral choice of killing or saving people in order to progress. Choosing to kill a person will let you pass each area easily, but choosing to save a person requires much more work - basically a complex puzzle. Amnesia: A Machine For Pigs is truly one of the strangest horror games that I have played. 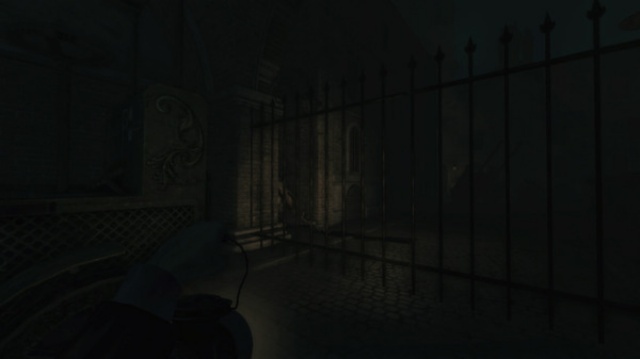 The game plays much like The Dark Descent but in a more modern location. You start out as a man that is searching for his children and must stay on the heels of a saboteur that is always one step ahead of him. Going into too much detail will ruin the plot, so I'll just say that the story to the game is all sorts of "what the hell", but it constantly has a creepy vibe to it and a very unsettling feeling. There is a lighter emphasis on puzzles in a Machine for Pigs, but you'll still run into them every now and then however they aren't near as complex as they were in The Dark Descent. The lantern that you carry has an infinite amount of oil and there is no sanity effect for staying in the dark for too long. The game focuses on story and overall scare factor more than anything. Many of the problems for this collection are visible when playing A Machine For Pigs. A Machine For Pigs has a good bit of slowdown very often while progressing. The game constantly makes lights flicker and the screen shake when enemies are present which causes the slowdown. The Dark Descent is also just the better game in the collection and runs without any problems. One bad thing about switching games is that you can't go back to the title screen menu without quitting and restarting the game - a simple option for restarting the collection through a menu option could cure this problem easily. Overall Amnesia Collection is a fantastic collection of horror games that is a must have for horror fans, especially those that prefer terror raised through overall atmosphere rather than in-your-face scares. If you've played SOMA and enjoyed the overall gameplay in it, you'll most likely find something to enjoy in this collection as well since all of these games basically play the same. It's good that Frictional Games is finally releasing their games outside of PC. Now, if we can just get them to release the Penumbra games as well! Final Rating: 80% - If you're a horror fan, then you should definitely check out Amnesia Collection.